The Seymour Fund is intended to help provide retired racing greyhounds with a chance to become companion dogs (pets), therapy dogs and service dogs. The Greyhound Advancement Center (GAC) administers the fund. The fund will be used primarily to support the operations of special programs for the dogs, such as our Hardee Hero Hounds program at the State of Florida’s Hardee Correctional Institute. GAC works cooperatively and synergistically with many other industry organizations to benefit these hounds. It takes many resources to deliver these services. The Seymour Fund has three accounts: Scholarship, Medical, and General. The medical account supports all medical greyhound needs for our special programs, but also extends out to our industry partners, especially partnering greyhound adoption agencies. The scholarship account is dedicated to sponsoring individual greyhounds through GAC special programs, especially our greyhound and inmate prison training program. The general account may be used for either of those purposes, or for general business expenses for operating GAC. 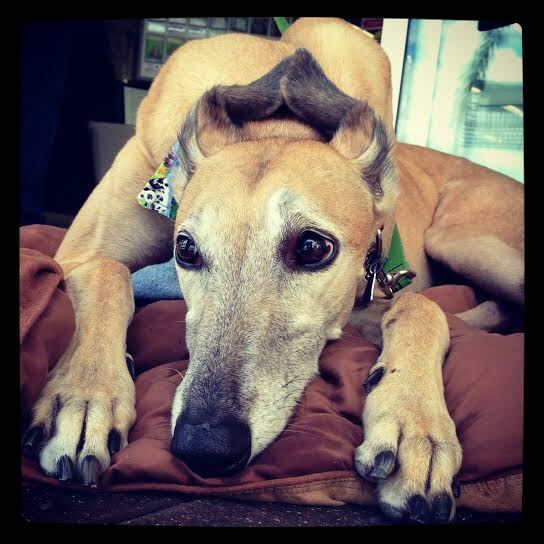 The Fund’s inspiration comes from our greyhound Seymour. He is perhaps the most important co-founder of GAC and its programs, and has been an important contributor to operating the programs themselves. One of the earliest prison trained greyhounds, he has served as a model of what a trained greyhound can be, and has helped other dogs reach that status. This January 2015, he was diagnosed with osteosarcoma in his shoulder and had that leg amputated. He missed a few prison training classes, then came back and has been helping again. But his latest x-rays showed a return of the cancer, and he will not be with us much longer. Seymour’s story is included below for those who are interested. On occasion, some of the greyhounds participating in the program require medical attention. While we are able to bring in professional veterinary volunteers to train selected inmate “vet techs” to handle routine medical procedure and identify and triage potential emergencies, every event requiring professional veterinary service effectively becomes an emergency. Emergencies, even with generous discounts from our veterinary partners, are expensive. Medical supplies for the prison venue are also significant expenses. In addition, we are also aware that our adoption group partners spend a large amount of money for medical care for their greyhounds. The Medical Account of the Seymour Fund is intended to help defray these types of medical costs. Typically, greyhounds entering our special programs are sponsored by greyhound adoption agencies, or individuals who are sending their own dogs for training. Occasionally, we have generous donors sponsor a hound into the program. The Scholarship Account provides a means to donate a smaller amount toward sending a greyhound to school. Or donors may still sponsor a specific dog, and receive updates on training, placement, etc. Donors contributing at least $250 to the Scholarship Fund towards the cost of sponsoring a greyhound through a training course at prison have the option of re-naming the greyhound if s/he desires. Operating non-profit programs requires many of the same expenses as any small business, and some extra ones. This inglorious work also demands some professional and miscellaneous expenses. Donations to the general fund may be used for these, or diverted to the other two accounts to maximize the quality of the programs and the number of hounds that can participate. Thank you for helping us reach our goals. Donors can contribute any amount. Donors may choose to direct their donation to the Medical Account, the Scholarship Account, or General Account. If you do not specify, your donation will go to the General Account. Seymour is our pet and beloved family member. That makes him special to us, and many who have known him. But he has also had the privilege of being a pioneer, and an example of what the magnificent Greyhound breed can be if we develop their natural talents to help others. Like most greyhounds, his first job was as a professional athlete. He raced 39 times, mostly in Corpus Christi, Texas. He reached the top level of racing, and had 11 win, place or show finishes. He best times were very good; his consistency? — not so much. His racing career ended with a broken right hock, a relatively common racing injury, but it merely launched him into his second career as an ambassador for greyhound adoption. Though he raced mostly in Corpus Christi, Seymour somehow found his way to Mobile, AL, and from there was inducted into the prison training program at Lakeland Correctional in Coldwater Michigan. We have his journal from there, and we quickly grew convinced that he liked his trainer there. He still sleeps under the ‘blankie’ that came with him from Coldwater. After his prison stay, he was still not adopted and was transported and kept in a local jail in Crystal River, FL. 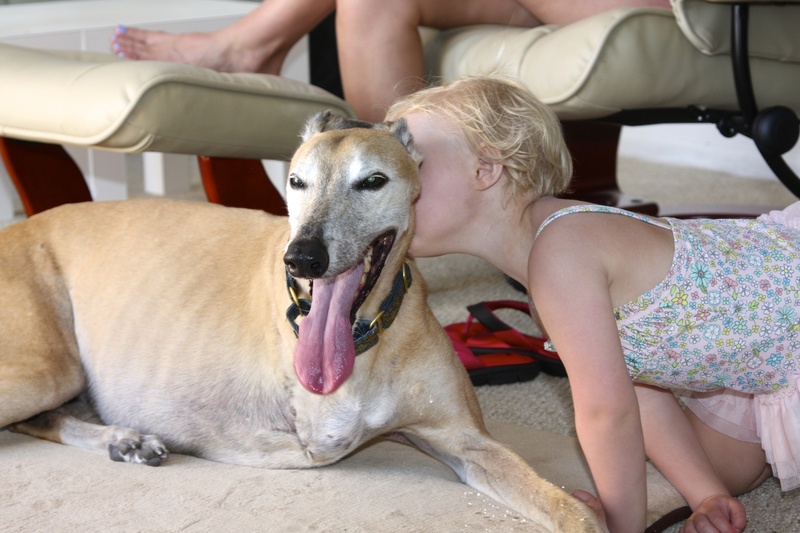 It was from there that he was delivered to us in Sarasota by Goldcoast Greyhound Adoptions. Nee H. G. Anubis, we renamed him to SeeMore, in honor of his thousands of years of breeding as a sighthound. The name quickly morphed into Seymour, who started to demonstrate an unusual combination of personality traits. Seymour has in general, a very laidback and neutral personality, but somehow turns into a great socializer in key situations, and a perfect ambassador for the breed. He was such a good (and easy) dog that we decided to involve him in greyhound adoption events. He immediately became a ‘greeter dog’ at meet ‘n greet events, reaching out to passersby and leaning into them to invite them in. 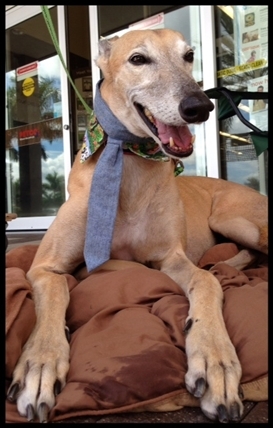 We decided we could open a Sarasota chapter of Goldcoast Greyhound Adoptions with Seymour as our mascot dog. We observed that he always behaved in accordance to his surroundings. We became the first fosters in the area for the organization. Well, we can say we are the fosters, but Seymour did (and does) 90% of the teaching. Again, he is he perfect host dog — never aggressive, not submissive, and always willing to lead and to teach. Since then, we have had somewhere between 65 and 90 fosters through our home, some for as little as a day, and some for as long as six months. We never had a single relationship issue with Seymour and any of those dogs, whether it was one at a time, or multiple dogs. Our daughter decided to use Seymour as a therapy dog while she was living with us. Seymour passed the tests with no further training and no fails and became a TDI therapy dog. We could see some of the same things in him years later when we took him to a meeting at the Zephyrhills prison, where he made a call at their palliative care facility during our presentation day. Our first granddaughter, Alina, grew up with us for her first 19 months. She adored Seymour, who was very good with her. Her first word was ‘dog’, and the first place she crawled was across the room to Seymour to lay down on him. The first word she ever said in her sleep was ‘Seymour’. He has always been 100% trustworthy with children. Seymour is pictured above with our granddaughter. Seymour is also good with small animals indoors or out. Here he is pictured on the side with our daughter’s rabbit named Smoosch. Since Seymour was prison-trained, we decided to get involved in such a program, and volunteered. Seeing the effect on inmates (women in the first case) had a strong impact on us. Seymour was at home in the prison, and worked with the other dogs. We saw an opportunity for him to work with the new trainer recruits, and it worked beautifully as he could actually help them to learn and gain confidence faster. We soon found ourselves operating that program and expanding it to advanced training to prepare the dogs for working with veterans with PTSD. Seymour learned some of those commands, but more importantly started to learn the thing that could not be done in prison — public access training. When the advanced dogs came out, it was Seymour who was ready to lead them through supermarkets, restaurants, airports, malls, and up and down escalators and elevators. He knows when he is working, even though you can see that part of him would rather go up and lean on friendly people. If you have ever seen a stream of greyhounds walking through public places on the Florida gulf coast, the odds are that Seymour was at the front of the line. More recently, Seymour co-founded the Greyhound Advancement Center with us. He travels every week to our Level 6 mens’ prison in Hardee County to help with the training. Again, he works primarily with beginners, but all the trainers like to have a turn with him. Seymour is also our partner in meetings, ‘sales calls’, and fund-raising events including speaking engagements, dog and greyhound ‘trade shows’, etc. He is comfortable in virtually any setting, thus he is with us constantly. And he is a wonderful living demonstration of what a greyhound can be. Seymour always has a calming, yet uplifting effect on people. Those are not unusual characteristics in greyhounds, which is what makes them so effective for those with PTSD, autism, anxiety and other psychological issues. What makes Seymour stand out is that after all his experience, he is perfectly consistent in his behavior. Many greys have personalities tending in these directions, and more and more greys are learning obedience. Many dogs can obey commands, but with that as his base knowledge, he seems to learn situations and figure out how to behave with few or no cues. Others have attested that if we leave him with them, he continues that behavior. That is consistent with greyhounds’ training since birth. Seymour on vacation at his friend Sam’s house. When we started GAC, the program was aimed primarily at helping the greyhounds. After seeing what these dogs can do for people, whether they be inmates, bedridden patients, troubled individuals, or just pet owners, we have changed our message. Our job is to put these greyhounds in the best position we can to help people, something they do more naturally and powerfully than most people can. The greyhounds have the “magic” – we just need to give them a few skills and place them out in the world to work that magic. Seymour brought us here, and there is no dog we have ever seen demonstrate it any better than he does, but now we have many dogs developing that potential after graduation from our greyhound and inmate prison training program. It is impossible to estimate how many dogs and people Seymour has helped indirectly, but some known counts: hundreds of prison-trained dogs; hundreds of pet owners; scores of foster dogs; many scores of inmate trainers; at least a dozen veterans; dozens with disabilities (in homes); and scores of patients in nursing homes and hospitals. 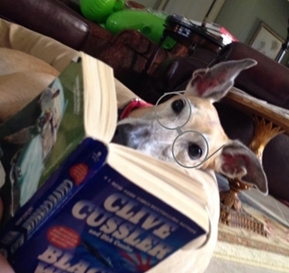 We can tell you hours and hours of stories of people impacted by greyhounds – and in the end, they all trace back to Seymour. But the best part is that there are now dozens of Seymours out in the world making it a better place. Please help us care for, train, and place as many greyhounds as we can – the world will be better for it.